Two women aged 58 are set to receive fertility treatment at a London clinic as record numbers attempt to become pregnant after the menopause. The two patients are thought to be the oldest so far to seek IVF treatment after the medical centre changed its policy on older mothers. One of those in contact with the London Women's Clinic has already been through seven failed IVF cycles. She is married and has no existing children. 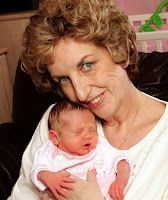 Pregnancy Stories by Age - Daily blog of hope & inspiration! I do believe that recipients of this medical marvel should be chosen. Not everyone deserves the treatment I daresay simply because yes, as some of the comments here, it would be quite unfair for a child at the age ten having a mom 7 times her age. But then again this wonder is a gift to all those who have waited all their lives to see an offspring they can call their own. Well good luck to the soon-to-be mommies and their children.